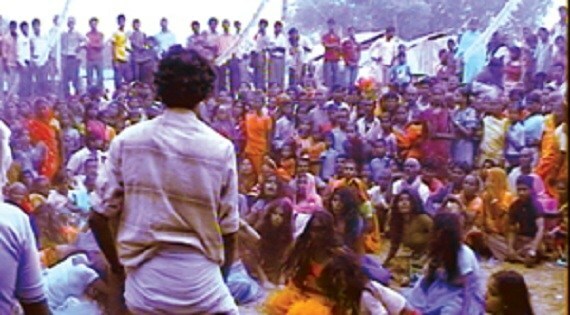 Gaushala – The traditional Bhoot Mela (the ghost fair) has commenced at the famous Sonamai temple in Mahottari district from today. The fair is held every year at the temple on the occasion of the Bada Dashain festival. The 'ghost fair' takes place for four days from Saptami or the seventh day of the 10-day Dashain festival. Hundreds of devotees including the so-called karanis come to fill the fair and pay homage to the goddess at the temple, the chief priest at the temple, Kameshwar Jha, said. Karanis are the people who are believed to be suffering from the evil spell cast by the ghosts and fiends. Hundreds of devotees and the karanis from various places of Nepal and India throng the temple in the belief that the people possessed by evil spirits will be excorsised of this influence of the fiendish forces after performing certain rituals at the goddess shrine. The shamans who also are among the devotees coming the temple say that people who come here crying in agony and pain go home happy after the evil spirits are excorcised. Scores of shamans and faith healers are seen busy chanting hymns and performing various rituals as part of the fair. It is believed that a person is protected from the evil spirits and bad omen by paying homage to the goddess during the 'ghost fair'.